The IBM System Storage TS3500 Tape Library, also known as the IBM System Storage 3584 Tape Library, is designed for medium to large automated tape storage and backup solutions and is part of a whole family of tape libraries for small to large tape automation solutions. Originally designed for IBM Linear Tape-Open (LTO) Ultrium Technology drives, the library was enhanced to also support the IBM System Storage Enterprise Tape Drive 3592 in preparation of System z server attachment. Together with the IBM System Storage 3953 Tape System, the TS3500 Tape Library attaches to System z servers as well as to Open Systems hosts. This book is intended for Hardware and Software Planners, System Programmers, Storage Administrators, and anyone involved in planning, implementing, and operating the TS3500 Tape Library in a System z environment. It is also suitable for everyone seeking detailed technical information about the TS3500 Tape Library and the IBM Tape System 3953 that allow attachment to System z hosts. 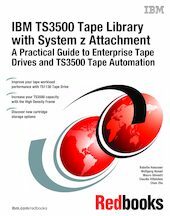 In this IBM Redbooks publication, we discuss the enhancements that allow attachment of the IBM System Storage TS3500 Tape Library to System z host systems through the IBM System Storage 3953 Tape System, which consists of the IBM System Storage 3953 Model L05 Library Manager and the Model F05 Frame. The IBM 3953 Tape System significantly broadens the attachment options of the TS3500 Tape Library, which is well established in Open Systems environments, and they allow nearly all platforms to share a single tape library. The latest version of the IBM Redbooks publication has been updated with the TS1130 Tape Drive (IBM 3592 Model E06/EU6) and Controller and enhancements to the TS3500 Tape Library, such as the High Density Frame that allows storage of up to 1320 cartridges in a single library.